Kid Safe: riding unicorn horse is designed and imported by a USA company. These hoppers are made of safe super strong, soft materials. Our riding toy is latex free and phthalate free (eco-friendly) vinyl and passes all safety tests and standards. Bouncy Unicorn is made for Toddlers and children. Kids will surely have a never ending fun! It also helps Strengthen Core Muscles and promotes Spatial Awareness. PERFECT GIFT IDEA - Ride-on hopping animals are a great birthday gift for a 1 year old, 2 year old, 3 year old 4 year old, 5 year old, and up. Jumping animals are great Christmas gift, Hanukkah (Chanukah), Kwanzaa. Diwali, Baptism gift, Christening present, or for any other special occasion. HIGH QUALITY - Our Bouncy Unicorns are made of premium quality materials that is strong and durable. This is a Stable 4 legged Space Hopper, Bouncy Unicorn. This unicorn is so comfortable and feels as if it is made out of cushion all while experiencing the Bob effect. The product is made of soft durable and comfortable material. This is an elastic unicorn and these are proven safe for kids. GREAT BENEFITS - Strengthen Core Muscles and promotes Spatial Awareness. Ideal Therapeutic Aids - used by Occupational and Physio Therapists nationwide. Ideal for both indoor and outdoor play. Children develop Co-ordination and Balance. 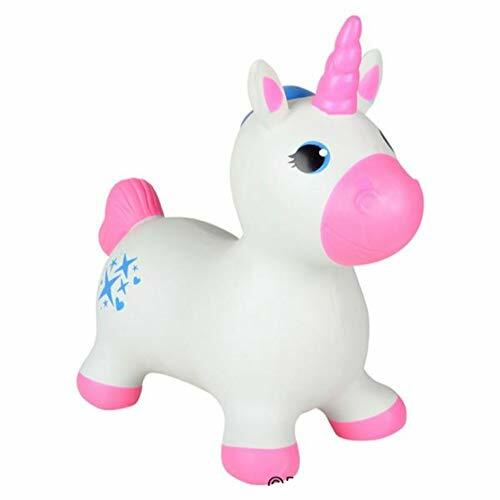 EASY TO USE - Take out the white plug from the hole on the Unicorn belly; insert the tip of the pump and inflate the hopper to good size, then Bounce! Easy to clean, heavy duty, phthalate free PVC. Just Open, Pump & Bounce Bounce! BOUNCY RIDE ON UNICORN - These Bouncy pink unicorns gives a positive sense of well-being. Our bouncy Hopper toys are designed to support active learning by developing; self-confidence, coordination, balance control, strengthen core muscles, improve motor skills, support play time and social skills and integration with other kids. If you have any questions about this product by Kicko, contact us by completing and submitting the form below. If you are looking for a specif part number, please include it with your message.